Autumn Escapes! September & October offer great value and fewer crowds. A splendid selection of September & October availability – Book Now! Relax on the lovely beach front terraces of this peaceful 3 bedroom villa near Rogoznica. 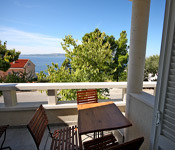 Spacious apartments near Trogir offering a child friendly pool and direct access to the beach. 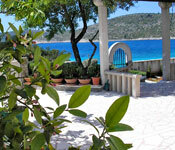 This interior designed villa with pool near Trogir offers direct access to the sea. Just minutes from the Old Town, this charming historic villa with garden and BBQ offers great value in September. In the heart of the old town, this lovely studio with balcony is perfect to explore the city. This delightful stone villa lies in Cavtat Old Town and offers beautiful harbour views from the vine-covered terrace. This impressive sea front villa near Omis offers spectacular views of Brac Island. Lovely one bedroom apartments opposite one of Croatia’s finest beaches. These comfortable apartments with sea facing balconies lie on the beachfront and offer a great value autumn escape. 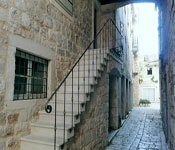 Stylish town house on Hvar offering traditional “Konoba” style dining area and great location in Stari Grad Old Town. Experience harvest time at this cliff top vineyard estate, complete with private access to a long beach near Bol. 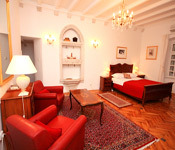 Book your 2012 dates now to secure your desired property and take advantage of low rate airfares with Croatia SkyScanner. Get the best deal by checking out our Top 10 Tips for booking your 2012 villa or apartment.